A classic finger-picking song by Fleetwood Mac that I’ve been trying to learn on guitar myself. It’s not easy and when I deconstructed how to play the song, I gained even more appreciation for it – and for Fleetwood Mac in general. The way his thumb works the bass notes while his fingers pluck the higher strings is captivating. Of course, many other great songs have used this technique but I have a new found respect for Lindsay Buckingham after learning this track. There’s a definite vibe that goes along with the song that always puts me in a good mood. I still love Kanye’s music and the medley he performed the other night on Late Night with Seth Myers was pretty fantastic. It’s been 10 years since The College Dropout came out and when you put some of his best tracks back-to-back-to-back like that, it’s impressive. Aside from being fun to hear songs that I haven’t heard in some time, it’s also a reminder that he has so many others great songs – ones that weren’t included in the medley like “Gone,” “Through the Wire” and “Family Business.” Those were the first three that came to mind but there’s so many others. I don’t fully understand what Kanye is going through that has led to his long-winded rants about breaking down barriers and entering the fashion world. But I do know that the guy is a genius when it comes to creating and producing music. He’s obviously really passionate about fashion but I just hope he doesn’t give up music completely. Seth spoke about that grittiness he displayed on “Last Call,” one of my favorite tracks from The College Dropout. I don’t think he’s lost that just yet and as long as he feels slighted, I’m sure that he will continue to produce. Ten years from now, I just hope it’s another medley of songs and not fashion lines. 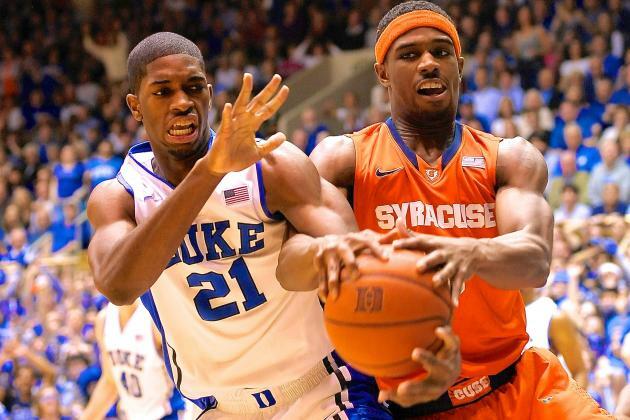 Could there have been two better games to start the Duke/Cuse rivalry in the ACC? Both were INTENSE games that came down to the final minute and we’re decided by controversial calls/non-calls. As a basketball fan, they were fantastic theater. As a Cuse fan, they were stressful to say the least. The history of the programs and coaches were enough to make this new rivalry an intriguing one but after these first two conference games, I expect every time these two teams play to be legendary. Thanks to the ACC tournament, it’s likely that Cuse and Duke will meet again for a rubber game and of course there’s a possibility that they can play each other in the NCAA Tournament. Having said all of that, last night’s offensive foul call against C.J. Fair in the final minute was a horrendous call. It decided the game and Hood was clearly still moving his feet into the position when he and Fair made contact. If anything, it should have been a blocking foul sending Fair to the line for a potential game-winning free throw. Boeheim saw how terrible the call was and freaked out, received two technicals and got thrown out of the game. I love that Boeheim got that upset because that was a HUGE call but obviously there’s still a chance that we can win if his technicals don’t give them 4 free throws. So, the future Hall of Famer has received some criticism for costing the Orange a chance to win. I don’ t see it that way though. Yes, we could have fouled, hoped they missed one and hit a three to tie. But the game was over when that call was made. This was a big game and Boeheim’s reaction felt totally warranted given what had just played out on the court. So Syracuse has lost two in a row and now we’ve got to turnaround and play Maryland on the road Monday night, then Virginia on the road on Saturday. The perfect regular season was an unrealistic dream but I still held out hope nonetheless. Now I’m relieved that we lost on Wednesday to BC because receiving your first loss in the fashion that we did on Saturday would have been heartbreaking. Even with both of those losses, ESPN’s Joe Lunardi projects that we will still be the #1 team in the country. That would be nice but now that the Duke games are done and we are no longer undefeated, it’s time to focus on the postseason. I hope we learn from these losses, become better and gain the extra motivation needed to win the ACC tournament and then follow that up with another Final Four. Brilliant. I’m so glad that Jimmy Fallon hasn’t changed the content of his show at all since taking over The Tonight Show. For his first week, he has just been bringing out his best bits to show new viewers what he is all about. A great idea for sure and as a fan for a while now, I really appreciate the tour de force that he has delivered. We got an evolution of dance, a hashtag bit, a Brian Williams rapping bit and a game of charades all in the firs three days. Not to mention some pretty entertaining interview and musical performances. These first three shows have been fantastic and his audience should continue to grow. I don’t care about ice dancing. I don’t know anything about the sport and I certainly don’t understand the scoring. Despite these facts, I am enthralled with the ice dancing competition in this year’s winter olympics and there’s only one reason for that – good storytelling. NBC is smart. They get it. The winter olympics are filled with obscure sports and hard to understand rules. So how they get people interested? Tell them a story. Make us understand where these people came from, how hard they trained, and how difficult what they’re doing actually is. Enter Meryl Davis and Charlie White. The duo has been skating together for 17 years and they earned the silver medal at the Olympics in 2010. Their arch rivals, a Canadian duo, beat them out in Vancouver. Both pairs train at the same facility in Michigan and even share a coach. After learning all of this, how could I not watch and see what happened. Adding to the drama is that a 90 second routine will decide their fate after years and years of preparation. That’s a lot of pressure. Couple that with the superbly produced interviews and packages that aired both during olympic primetime coverage and on NBC news, and there’s no way I’m missing it. Today, Davis and White, set a world record with their score in the long program and they became the first Americans to earn the gold medal in ice dancing. I’m thrilled that I got to watch it and I’m equally thrilled for Davis and White. That’s the power of good storytelling. It made me seriously invested in an event that I have no history with and that I still know very little about. A compelling story can have a lasting impact and incite positive change. My unexpected interest in ice dancing is an important reminder of that fact. 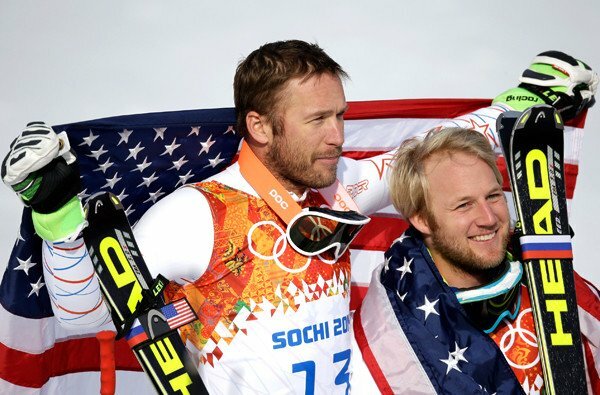 Bode Miller had just become the oldest alpine skier to earn an olympic medal. It was a pretty great moment, even if it was a bronze medal that he was sharing with another skier and not a gold. Unfortunately the interview that followed left me feeling uncomfortable rather than excited – and if Twitter is any indication, I wasn’t alone. The reporter continually asked Bode about his younger brother, who had recently passed away. It’s definitely a valid question, but to keep pestering and framing the same question in different ways was extremely insensitive. It became clear that he was emotionally affected by the circumstances yet the questioning didn’t stop. His story had been shared through well-produced video packages, interviews and the fact that we can hear the interactions with his wife immediately following his run. As a viewing audience, we knew what was going on and what this accomplishment meant for Miller. I understand that the interviewer is in a tough spot with such a sensitive subject but it could have been handled differently. Also, this wasn’t live which means that NBC chose to air it in its entirety anyway. I might have cut it short once he got to the point where his emotions pretty much prevented him from speaking. Overall, the interview soured what was supposed to be an exciting and memorable moment. However, Bode Miller does not want anyone to blame the interviewer Christin Cooper. Rich Sandomir wrote a worthwhile piece on the interview. I agree with his take and I was thinking the same thing while watching. This is a good learning experience for any aspiring journalist. I’m all for variety in questioning but there are limits and boundaries that should be adhered to. You wouldn’t want to make someone cry when talking about a loved one who just passed in regular conversation, and you certainly should not want to do it while conducting an interview. Hitting a buzzer-beating, game-winning shot is one of the coolest things you can do in sports. 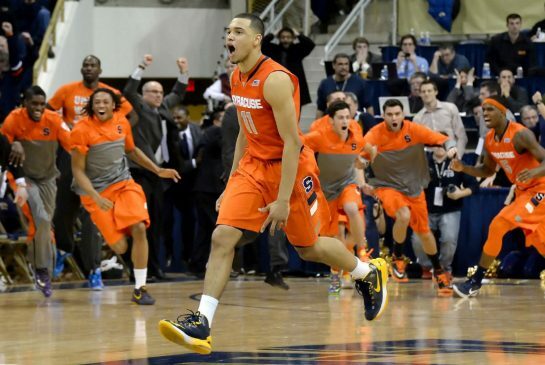 Cuse freshman point guard Tyler Ennis is the coolest player in college basketball this season. Nothing fazes him and as the game situation gets more and more intense, he becomes more and more calm. So when Ennis hit that game-winning 40-footer to keep the perfect season alive, cool exploded and a new level of cool was achieved. This Cuse season has been really special so far. There have been moments when we were going to lose, like Wednesday, but then we just don’t. It usually involves Tyler Ennis or C.J. Fair taking over a game and coming through with a clutch play or two or three. Against Pitt, Fair scored 8 straight points to help erase a 6-point deficit with 95 seconds to play. Then Ennis did the rest. Overall, this was a just an awesome win that I’m still so pumped up about 3 full days later. I can’t believe that Pitt was 9-0 against Top 5 teams at the Peterson Events Center before that game last night. It shows just how hard it is to win there. But the Orange prevailed and even Boeheim cracked a huge smile when the shot went in. Ennis stayed cool (obviously) but you can tell that even he was impressed with his unlikely accomplishment. Ennis is having a nearly perfect freshman season. His stats are ridiculous, especially in the final 5 minutes of close games. He has yet to commit a turnover in those situations while also shooting 9-10 from the field and adding 6 assists. Not to mention, he is a perfect 14-14 from the free throw line in the final 5 minutes of one possession games. That’s the definition of clutch. Those stats might be impossible to keep up but the fact that he has accomplished what he has thus far is remarkable. I can’t wait to see what more he and this Cuse team can do. Ennis has been outstanding and he deserves all of the accolades but this team (which is only 7 players deep) has also been getting major contributions from everyone. C.J. Fair is the senior leader and he always seems to come up with a huge shot or rebound when we need it most. Cooney single-handedly won the Notre Dame with a career high 33 points. He couldn’t miss from three – anything he put up was nothing but net. Jerami Grant and Fair each had career highs in the Duke game, which was the best college basketball game I think that I have ever seen. Both teams were the best versions of themselves and continued to hit shots. The game matched the enormous hype, which seemed impossible. Christmas, Gbinije and Keita are key role players and each and every one of those 7 guys will be needed down the stretch. Give me this team, especially Ennis, Fair, Grant and Cooney over any other team in college basketball right now. The first-ever ACC tournament for Cuse is going to be electric, but before that we’ve got a HUGE rematch coming against Duke next Saturday. What a ride this season has been so far and hopefully it’s going to continue until April 3-5 in Arlington, Texas.